AWCO leverages a vast network of warehousing and trucking solutions to find local, affordable and quality transport for your products. Our partners supply many options for shipping freight by truck and safely transfer many perishable, heavy, delicate or other specialized materials. Your products move between shipping, storage and sale swiftly and securely without weighting your business with logistical complications. Our clients offer full-service trucking and warehousing services anywhere in the USA, Canada and Mexico for nearly any products. 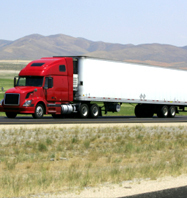 Freight options include expedited, refrigerated, frozen, flatbed, heavy haul and straight truck, as well as complete truckload or less than truckload (LTL). No matter the materials or amounts, AWCO can help you move your products to storage, distribution or shipping anywhere in North America. To optimize cost efficiency and further streamline your logistics, we also offer LTL consolidation services, drayage, import/export handling and other services. To find out more about freight by truck shipping capabilities or other services, contact us today.